Mya Swan was born and raised in Alaska where she learned core values, morals, work ethic, and how to catch big fish. She moved to Phoenix, Arizona and earned her Bachelor of Science Degree in Human Anatomy/Biology at Grand Canyon University while working as a physical therapy technician. She then went on to earn a Doctor of Physical Therapy Degree from Arizona School of Health Sciences, a branch of A.T. Stills University. Her work experience includes orthopedics, aquatics, and equine assisted therapy. She has worked on persons ranging in age from birth to 98 years, with a wide range of diagnoses, in a variety of settings. She is a highly skilled manual therapist. It was through her advanced training in manual therapy that Mya discovered the most authentic and effective form of manual therapy, John F. Barnes Myofascial Release. It was immediately clear to her why this form of therapy was sought after by patients and therapists alike from all over the world. She then became a part of the hand picked John F. Barnes team and worked at the world renowned Myofascial Release Treatment Center, "Therapy on the Rocks." Her role as a Lead Physical Therapist allowed her to provide personalized Myofascial Release sessions, teach Myofascial Release stretching classes, and assist in the training of other Myofascial Release Therapists. Mya loves to expand upon her knowledge and skills and continues to train under her mentor, John F. Barnes. Mya continues to work for John F. Barnes through providing fill in coverage at Therapy on the Rocks. 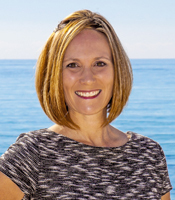 She works as an instructor assisting John F. Barnes with his Myofascial Release Seminars for health care professionals and his Myofascial Healing Seminar for patients, caregivers, and health care professionals. Mya is in tune with the needs of the body and is educated in following those cues. Mya believes that the body is a unit, not to be broken up into parts, and takes a holistic approach to therapy. Above all else, Mya enjoys helping others achieve their maximum potential, and realize their dreams. What are our patients saying about Mya Swan, PT, DPT?